Roberta L. Smith is a member of the High Desert Branch of the California Writers Club. The club has published three anthologies. 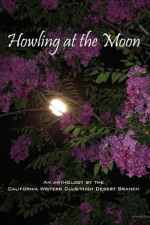 Howling at the Moon and Desert Gold are filled with great short stories and poems. Smith's When She Feels Like Nothing can be found in Howling at the Moon. The club's latest anthology is filled with touching memoirs from students of the Academy for Academic Excellence. Senior citizens with fascinating stories to tell pass away every day without those tales being recorded for future generations. Concerned members of the HDCWC decided to teach local high school students the basics of memoir writing and asked that younger generation to interview their elders so that they could capture those vanishing legends. The result is this terrific anthology. Memoirs were written by the students of the Academy for Academic Excellence. The book was published by the High Desert Branch of the California Writers Club. Just as tantalizing as the 2011 anthology, this time there are forty-four authors included in the HDCWC's latest endeavor. Ten authors are from the club's prison outreach program. You'll find a little something for everybody. Poetry and short stories. Fiction and non-fiction. A tantalizing collection of the best poetry, essays, and stories from over 30 Southern California Writers, all members of the century-old California Writers Club, offering their first anthology from this branch in the 21st Century. Two stories: When She Feels Like Nothing and The Miracle, from Roberta L. Smith are included in this excellent collection.